WiFi on SD card: Eye-Fi! WiFi on SD card: Eye-Fi!, originally uploaded by scobleizer. Does that do what I think it does?! 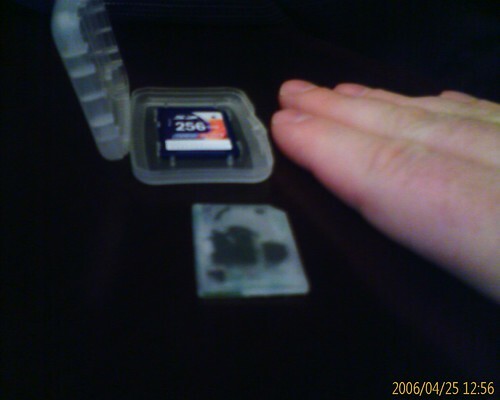 Acts like an SD card to the camera, but transfers the photos wirelessly? That is an insanely great idea. How come no one thought of this before?! That would turn any SD-compatible camera into a WiFi enabled camera. Robert, you have to give us more info on this. 🙂 Here’s Robert’s post on the demo of this he got, and here’s a link to the Eye-Fi site (careful googling that name – I got a lot of pr0n links when I went looking). → Congrats to Michaelb – Winner of the “Big Intel News” contest! Josh: Kudos for ‘getting it’ based only on Robert’s Flickr comment. Yes, you will be able to go to online destinations (a la Flickr) directly from the card, no PC required. I’ve been saying for a while that I’ll buy the first wireless digital camera that can upload directly to Flickr. Sounds like now I’ll still be able to use my favorite camera, and not be tied to one camera’s features, limitations, etc. How does this differ from other SD cards whith build in WiFi and memory? We have been using them for more than a year i PDA’s now.